Yes I am talking about My Honey & Honey. In this blog post I want to share with you some thoughts on love but also what honey does for you in your life. Bees have begun to fascinate me and the time it takes to learn how they work as a family unit of thousands is admirable in what community truly means in the world of a honey bee. Lets start with the Honey that you spread on toast, the honey that you add to your tea, the honey that you eat straight from the jar! As a beekeepers wife you begin to understand the seasons of work that honey bees and their owners go through. In fall the preparation for winter begins, feeding the hives sugar water to replenish their resources due to the lack of nectar available through pollination as the cold weather encapsulates our surroundings. The bees continue to work within the hive and go out when they can to forage what they can when the days are warm and dry from rain with a minimum temperature being 55-60°F. When winter hits, the bees stay in their hives generating a mass body heat and huddle together to stay warm keeping the hive at a steady 85°F. This is the point where a beekeeper is challenged with hope and patience. The hive stays closed throughout the winter months so as not to let any heat escape. Tapping on the boxes allows the beekeeper to hone in on the sound of the bees buzzing around and continuing their days in hibernation. No sound is not a good sign, but the joy of jumping in the snow when you hear the quiet hum of the bees at work is fun to watch and be a part of! In the spring your managing the swarms, chasing the expansion of hives, working with the bees to make sure they're healthy, and producing honey for both themselves and for us to extract for bottling. This is the beginning of the height of the season. 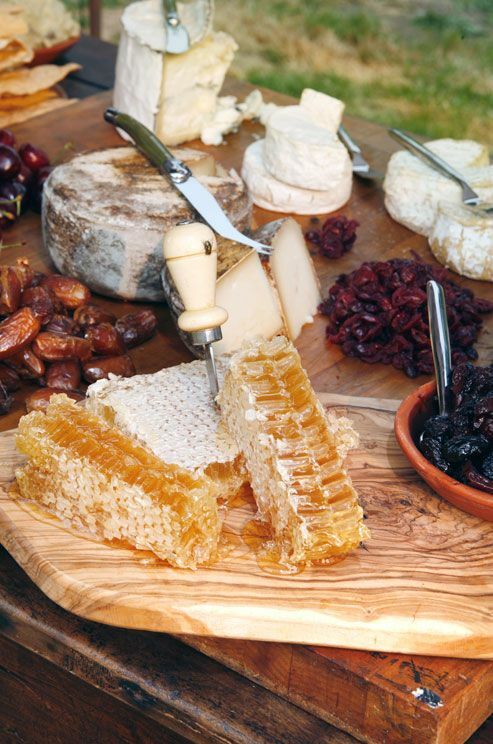 In late summer is when things get sticky and hours upon hours are spent extracting the honey from the hive in a variety of forms, from liquid gold that goes into bottles to carefully cutting squares of honey comb to box up and serve with you traditional charcuterie board. So with that said what are the nutritional and medical properties that honey has? Nutrients & mineral contents: B6, thiamin, niacin, riboflavin, pantothenic acid and certain amino acids, calcium, copper, iron, magnesium, manganese, phosphorus, potassium, sodium and zinc. When you fall in love with another person, you learn to sacrifice yourself and certain priorities you may have thought were important until you found your soul mate. I am a Pisces so I tend to transform myself to fit and blend more smoothly into the love of another persons arms. Its important to not lose yourself completely, but find a greater understanding of what compromise means in a relationship. Sharing the balance of sacrifice, of yourself and of your partner is a skill that takes many years to master and is constantly a learning curve as we as people develop and change with age. As newlyweds we continue to grow keeping up with the steady development and bloom of our relationship. We have proclaimed love for one another publicly and been bound by paperwork which has allowed us to move forward in our relationship and learn from our past time spent together, now as a married couple. I have learned to be silent when Justin needs ears to listen, share thoughts when he loses his way and needs guidance and support. I have learned many upon many little tidbits that make our relationship successful that I wanted to share with you, because each of us needs and deserves love in this world. Each of us must learn to love one another, to love yourself and to teach others how to love with clarity from outside perspectives. In life there are no right or wrong answers to questions, in love, there is no right or wrong way to show love but to be the essence of it in your soul. Of course as any other human, we are not perfect and have our moments of fire and volcanic flow, but these can only be learned from allowing us to train our feet to withstand the heat and walk forward with grace and positivity knowing that we can move on from this dark time in our lives. Learn what makes you partner tick. What excites them? What are their interests? Its important to know what they love to do, because they'll probably want you to be a part of that. I love to learn about the bees, Justin's thing is 24/7 honey bee. I can offer him my time to learn and show my enthusiasm and support for what he does. I don't necessarily love working in the hive, but I'll come and have a close up look and share my curiosity for this other worldly wonder. The importance of patience. On those good days and those bad days, generally all days... being patient with your partner is key. Each of us has had a different upbringing, perspective on life and ways that they process and understand information with regards to their past. Learning to be patient is so helpful as it means that you need to work together to have the same understanding of a topic of conversation. Sharing time. Some (like me) require love with quality time. Breathing together and having conversation with all attention on the moment show that there's a deeper connection in the works. A moment of time that is frozen on the focus of the 2 people that are there...connecting. I have learned that beekeepers in general are givers. Always willing to work to the bone, in return being gifted sweet honey from the bees that they do nothing but share and giveaway. In order to be a beekeeper you have to have a work ethic that is calm and collected, almost slow motion, it requires patience and working with another species. It requires communication through observation without any form of verbal dialect. Justin I believe brings what he knows from the hive into our relationship, using it as a way to communicate with me, his family and the people that he surrounds himself in life. As his wife, I have learned to adapt with what works for him in a loving relationship. Life is long, but moves fast. Learn from the life of a beekeeper and move in slow motion. Your task will eventually be done, but more importantly the moment is extended when you move at a slower pace in life. Live freely to express your love for people and passion for things you love to do in life. We only have one opportunity to share with the world what it means to love. What it means to be as sweet as honey. This helps me in ways I can not convey. Thank you so much for sharing, again and again. I can tell by your wedding photo that your are an incredibly loving couple who are very zen together. I is such an amazing gift to find your soul mate, so happy for you both. So eloquently written, thank you for all you have given in our relationship and I look forward to reading much much more!